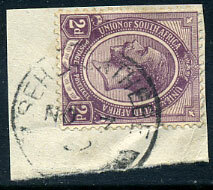 (D3) dated A/DE 21 23 on South Africa KGV fragment glued to white background. (D3) 30 VII 54 on KG6 1d (SG.19). DE 21 96 on CGH ½d (SG.48), blunt corner perf. 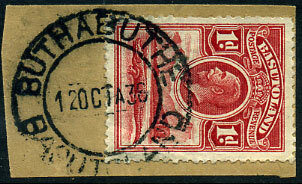 (D7) 12 OCT 36 on KGV 1d (SG.2) piece. (D13) 18 VII 52 on KG6 2d (SG.21). (D10) 1 VII 52 on KG6 2d (SG.21). (D13) 24 II 55 on QE2 3d, 6d (SG.46,48) piece. 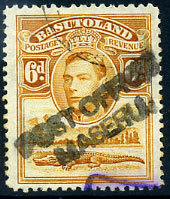 dated 12 MAR 38 on South Africa ½d, 1d piece with pair Basutoland KGV 1d uncancelled as unaccepted for postage. 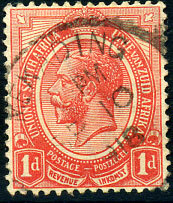 (D3) NO 7 32 on South Africa KGV 2d (SG.6) piece. 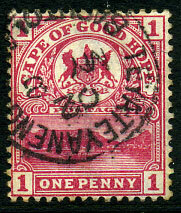 (D3) NO 2 12 on Transvaal KE7 1d (SG.274). 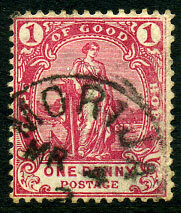 (D2) 11 JUL 36 on KGV 1d (SG.2) piece. (D3) SP 2 03 on horiz. 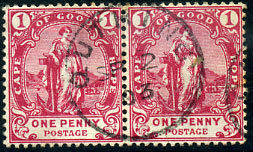 pair CGH 1d (SG.59a), right stamp with vertical crease and two lightly toned perf. tips. 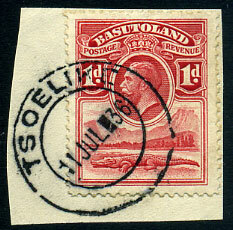 (Proud D1, Putzel unrecorded) SP 10 1918 (ERD and LRD) on South Africa KGV 1d. 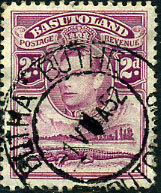 (D13-1) JU 13 21 on South Africa KGV 2d, 4d piece with "R" in oval (applied Maseru?) 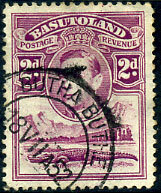 and bluish 2-line -MAFETENG.-/BASUTOLAND. (unrecorded reg. 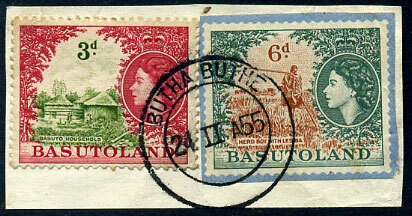 h/stamp or private marking?). 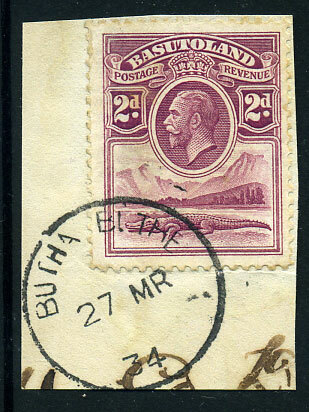 (D4) OC 20 27 on South Africa KGV 1d x 2, 6d piece with BUTHE BUTHE. reg. h/stamp alongside. 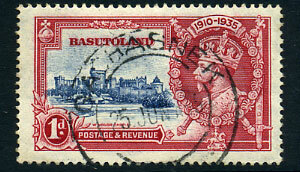 (D2) 4 JUL 36 on KGV 1d (SG.2) piece. 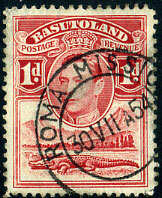 (D4) 16 JAN 36 on KGV 1d (SG.2) piece. (PP3) 2-line parcel canceller on undated KG6 6d (SG.24). dated MY 15 02 on CGH 1/- (SG.67). 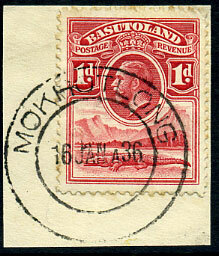 dated MY 3 02 on vertical pair CGH 1/- (SG.67). MY 26 02 on vertical pair CGH 1/- (SG.67). 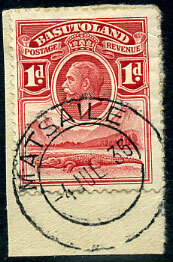 (D6) relief cds dated 27 MR 34 on KGV 2d (SG.3) piece. 02/MY 8 on CGH 1d (SG.69), minor toning. 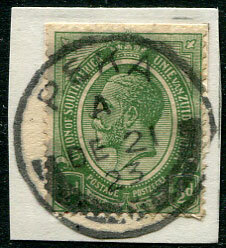 (D3) MR 4 2 on CGH 1d (SG.59a), minor rubbing.